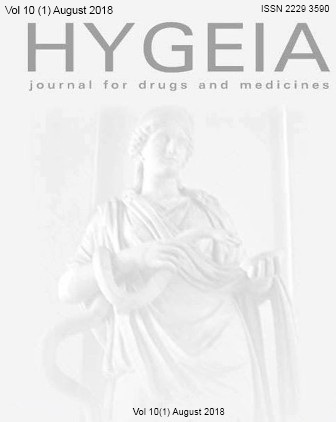 Hygeia journal for drugs and medicines' is a peer-reviewed, half-yearly , open access journal specifically intended to publish original , informative, scientific research and review papers concerning various aspects of Pharmaceutical sciences like Pharmaceutical Chemistry, Medicinal Natural Products, Pharmacology and Therapeutics, Clinical Pharmacy, Pharmaceutical-biotechnology, Pharmacoeconomics, Biopharmaceutics & Pharmacokinetics, Pharmaceutics,Formulation technologies, Pharmaceutical-analysis, Drug design, Phytochemistry, Pharmaceutical Regulatory affairs, Pharmaceutical Biology and other related fields like Biochemistry ,Bioinformatics , Microbiology, Nano-medicine , Research on traditional and alternative medicines etc . 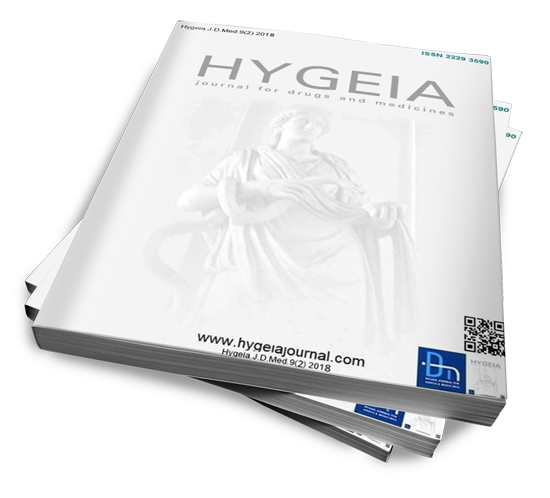 Original contributions as full papers, short communications, reviews, scientific correspondence or as research news in English, confirmed with accepted scientific standards and strictly following the “Instructions to authors” can be submitted through manuscript submission page of the journal website or by email ( hygeiajournal@gmail.com / hygeiajdmed@gmail.com ). 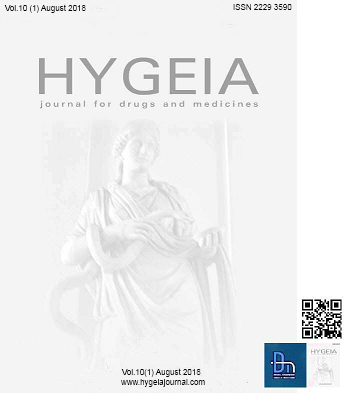 The Hygeia: journal for drugs and medicines (ISSN 2229 3590, 0975 6221) is abstracted and indexed in Indian Science Abstracts, Index Copernicus, Google Scholar, CrossRef, EBSCO , ELSEVIER: EMBASE, Chemical Abstract Service Source Index (CASSI, a division of American Chemical Society) , HINARI (WHO) , WHO-APAME , International Center for Chemical and Biological Sciences Libraries(ICCBS), National Library of Australia, The University of HongKong Libraries ,The European Library, DAIJ ,National Library of Medicine (NLM) catalog , division of NCBI, USA,Open Academic Journal Index etc . Country of Publication: India , Online ISSN: 2229 3590, DOI: 10.15254, Established in: 2009 , Language: English , Frequency: Half-yearly ,Publication Dates: first week of April & October every year, Place of publication: CD remedies Coimbatore,Tamil Nadu, India , Available from: www.hygeiajournal.com,Format: electronic , Scope: all fields of Pharmaceutical sciences, Open Access: Yes, Indexed: Yes, Publication strategy: Peer-reviewed/Refereed, Method of Submission: email / Online, Submission E-mail: hygeiajournal@gmail.com, Alternate E-mail:hygeiajdmed@gmail.com , through online : MSS ( manuscript submission system ) & MTS ( manuscript tracking system) . Hygeia is the Greek goddess of health and she was worshiped in connection with Aesculapius, her father, the god of medicine and health. She is said to be again, the granddaughter of the God, Apollo. She is also the sister of Panakeia or Panacea (means all-cures)Akeso (Goddess of Healing), and laso (which means Remedies). Hygeia is usually depicted as a young woman, who holds a sacred snake (symbolizes resurrection),which is often combined with the rod of Asclepius to form the caduceus or symbol of medicine. Often this snake is portrayed as drinking from a cup(symbolizing medicine), which has become known as the Pharmacist's bowl.Originally, she was the guardian of physical health and later became the goddess of mental health, as well. Eventually, she became a protectress against various kinds of danger, an attribute which she shared with Aesculapius. 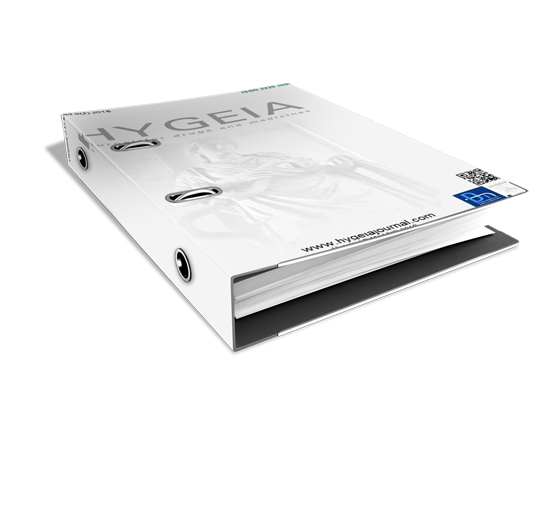 It is from Hygeia, the word hygiene originates. Hygiene is the science of preserving health. The subject of hygiene includes all of the agencies affecting the physical and mental well-being of people. In its public aspects, it is concerned with soil; climate; character; materials and arrangement of dwellings; heating and ventilation; removal of wastes; medical knowledge on the incidence and prevention of disease; and the disposal of the dead. Authors are requested to upload articles through manuscript submission system which enables the authors to track their submissions .